My maternal grandmother’s name was Martha Stephenson Hardin (I’m named Stephanie in honor of the Stephenson surname) and she was an orphan. The very fact that she and her sisters, Agnes and Helen, were orphaned when they were young makes me extra proud of her as a woman when I think of the things she accomplished. She was born in 1910. She lived in poverty in an orphanage, but survived, and went on to become a nurse and marry a handsome young engineer named Joseph Derwood Hardin. They had three daughters, Barbara Ann, Mary Elizabeth, and Ruth Marie, my mom. In 1976 my parents, my little sister and I moved to the Florida panhandle to live near my mom’s parents. During my growing up years there on St. Joe Beach, I witnessed my mom and Grammy, as we called her, make many crafts. They were always busy! They did ceramics, macrame, made all kinds of things out of shells they found on St. Joe Beach and Indian Pass Beach. They made lamps, refrigerator magnets, Christmas ornaments, picture frames, and much more with those shells, which were so abundant on the beaches in the ’70s, and they often let my little sister and me help. Another thing mom and Grammy did was make preserves, most frequently fig and pear. 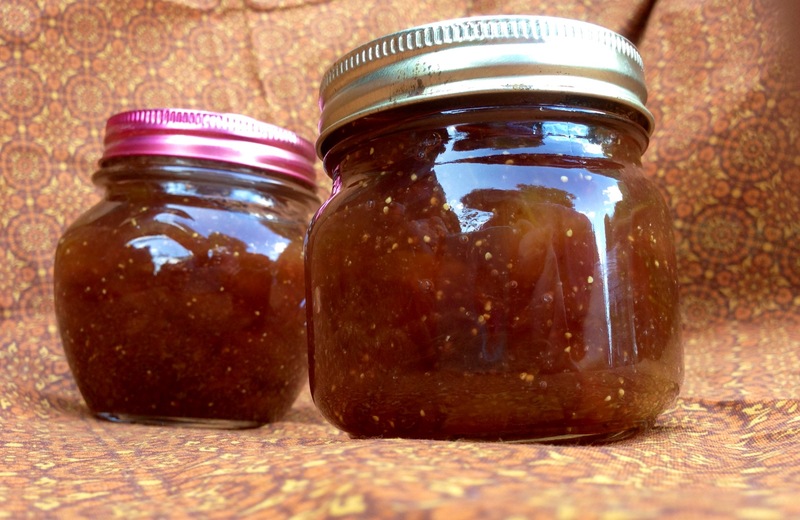 Grammy and Granddaddy had a fig tree, so when the soft, sweet fruits were ripe, mom and Grammy would work elbow-to-elbow in Grammy’s little kitchen, making sweet, syrupy fig preserves after Granddaddy picked the tree clean. 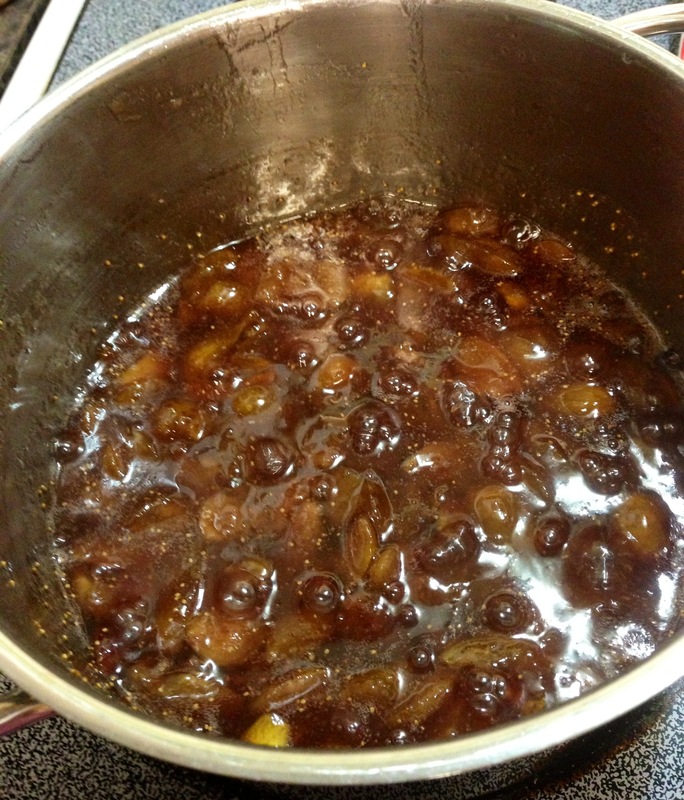 I liked the fruity syrup in the preserves; I thought the whole preserved figs were too big to eat on my toast. But the flavor…it was wonderful! Both my Grammy and my sweet mom are gone now, and I simultaneously smile and shed a tear when I think back on some of the days we spent growing up there at the beach. And when I had a bag of fresh, ripe figs last week from the local farmers market, I knew what I had to do…make fig preserves. Instead of leaving them whole like mom and Grammy, I quartered them after I washed and stemmed them. Also, I didn’t want to get my boiling water canner out of the storage shed for such a small amount of fruit, so I made refrigerator preserves. 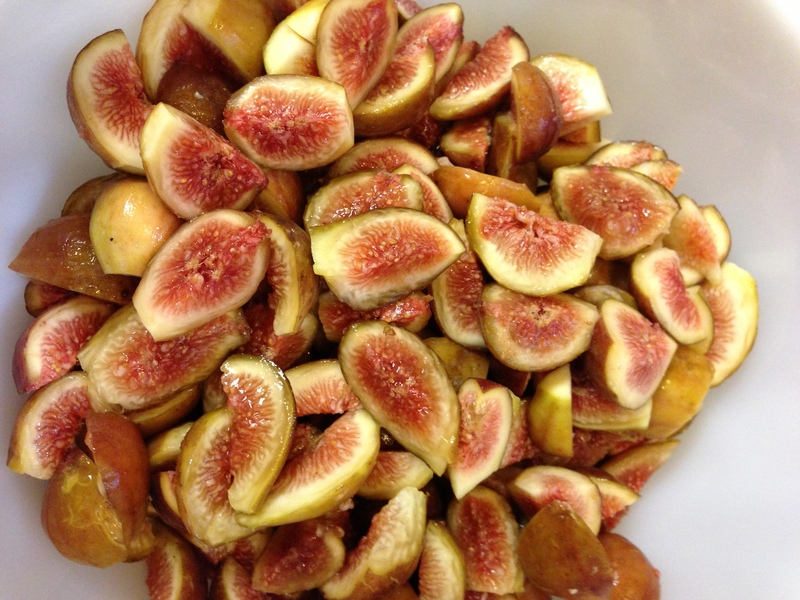 The recipe is simple, but the outcome is glorious if you’re a fig lover (figophile?) like me. Here’s my recipe which I will name in honor of my Grammy. 1. 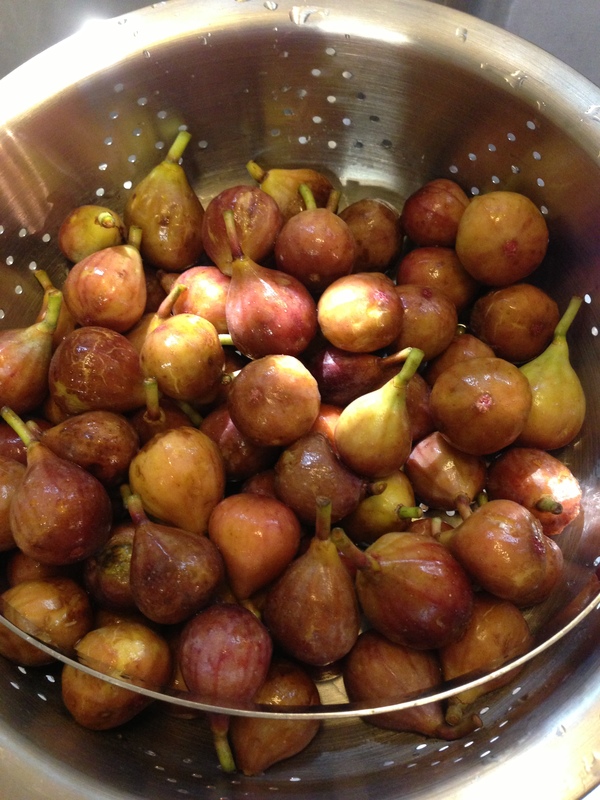 Place the quartered figs in a large saucepan. Pour the sugar over the figs, stirring to coat all figs. Add the water, and stir it in. Bring the mixture to a boil while stirring. 2. Lower heat but keep the mixture at a simmer; cook for 45-55 minutes, stirring often. Then add the fresh lemon juice, cooking for another minute or so. 3. Remove from heat. Allow to cool, then pour into clean jars, screw on lids, and place in refrigerator. (These are not shelf-stable; they MUST be kept refrigerated!) Makes about THREE CUPS. I hope you find these preserves as delicious as I do; I suggest using them on your toast, scones, biscuits, waffles, ice cream, or pound cake. (here’s my mom’s special pound cake recipe for you to try!) Please tell me how you like them if you make these or if you make something similar with your own recipe! Enjoy, and if your Grammy is still alive, please give her a hug for me. You might also like to try this strawberry jam recipe…full of delicious, sweet summmer flavor! With any kind of jam or preserves, you can make these wonderful little jam tartlets. So much fun to make and easy, too! Copyright 2013 Stephanie Hill Frazier. All rights reserved.